Our select range of 4 core speaker cables is ideal for use within speaker and high end audio-visual installations. Webro 4 core speaker cable is of the highest quality and guarantees users a reliable solution for many years to come. Our range of 4 core speaker cable includes 1.50mm2 (sheathed in LSNH), and 4-way flat 1mm2 (sheathed in PVC) versions. Other versions are available on request. Our 4 Core Speaker cables are ideal for use within low resistance pathways for speaker, high end amplifier, and audio visual installations. 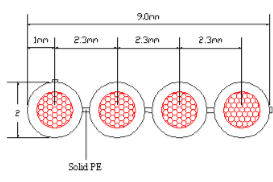 Please fill in the form below to request a 4 Core Speaker Cable datasheet. Most of our 4 core speaker cables are available from stock. Please contact us if you require a more bespoke speaker cable product. Our 4 way flat speaker cables are suitable for use within low resistance pathways for speaker, high end amplifier, and audio visual installations. Their flat design makes them ideal for hiding under carpet. Please fill in the form below to request our 4 way flat speaker cable datasheet.